New Holland’s patented Super Boom® vertical lift geometry provides maximum reach at the top of the lift curve, making it perfect for loading materials over the side of trucks and placing load in the center of the vehicle. Rock-Solid Stability: The long 200 Series wheelbase, combined with a low center of gravity and the correct front to rear weight distribution results in a smooth, stable ride. Superior Comfort: New Holland knows a comfortable operator is more productive. 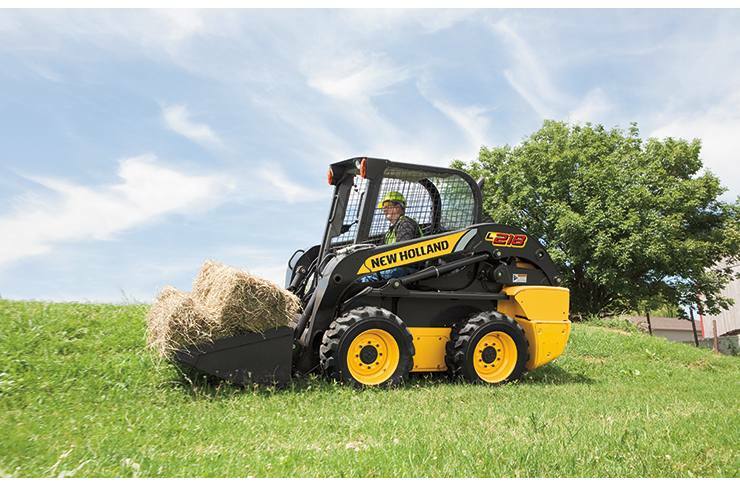 That’s why New Holland designed a cab with superior comfort and convenience and incorporates it into every 200 Series skid steer and compact track loader model. No matter which model you choose, you get a cab that’s one of the widest in the industry, with more head room and shoulder room and joystick controls that come naturally to your fingertips. Unmatched Visibility: Visibility is a significant advantage when you choose a New Holland skid steer. A low threshold to the front, a large rear window, large screen openings to the side and a see-through area on the cab roof assure you have a clear view in all directions. Maintenance Made Easy-Unrivaled Access: When service is easy, it’s more likely to get done, so you can reach all daily maintenance checkpoints by opening the rear hood and door. The convenient New Holland flip-top cab allows you to tilt the entire cab assembly forward, if necessary, for complete access to your machine components.